If you haven’t heard of Corning or their href=”http://www.corning.com/gorillaglass/index.aspx” rel=”homepage” target=”_blank” title=”Gorilla Glass”>Gorilla Glass then let me explain. Their product is essential to almost all smartphones and tablets as of late and are on a majority of all href=”http://code.google.com/android/” rel=”homepage” target=”_blank” title=”Android”>Android devices (not the Galaxy Nexus though) and their glass protects that precious screen of yours. 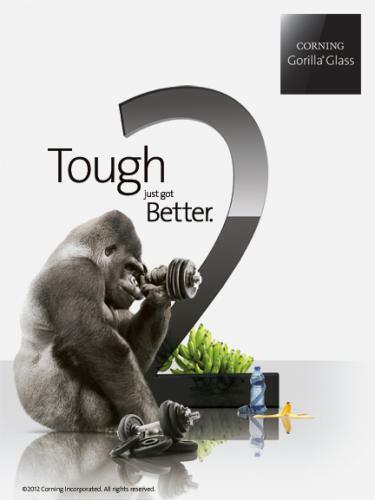 We all know Gorilla Glass is tough but things are about to get even tougher with Gorilla Glass 2. We haven’t heard much about Gorilla Glass 2 yet but there is plenty to improve over the original. While it is extremely strong and scratch resistant you still hear friends and family members alike suggesting smartphone buyers get a screen protector right away — basically as soon as they unbox the new phone. I’ve personally not used screen protectors over the past few months myself. Today Corning has just announced they’ll be unveiling their new Gorilla Glass 2 at this years href=”http://www.cesweb.org/” rel=”homepage” target=”_blank” title=”Consumer Electronics Show”>CES. We will be there live next week to capture all the goodness and hopefully get some hands-on time. You can expect the new generation of tough glass to be thinner, stronger, and even more scratch proof. Hopefully they have something amazing to show us. We are hearing they’ll have an 82″ multi-touch LED on display covered in the new glass so that should be fun.